We’ve been very busy since our return from BGG Con. This was our first time attending this convention, and it was fun. 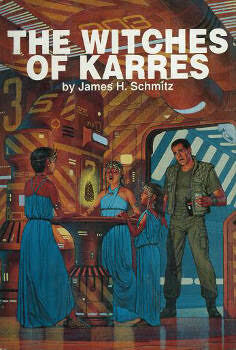 As advertised, playing games was much more emphasized than tournaments or dealers’ rooms. We did have a dealer’s booth for one day, and played a few games there, but ended up playing more once we got out into the open gaming area. One of the things we were really looking forward to was showing off the pre-production prototype of Star Traders and being able to play with the actual d4 Contract dice that Panda brought to the show, newly delivered from the manufacturers. They were too big (more about that, later), but they worked really well. Overall, the game was well received. 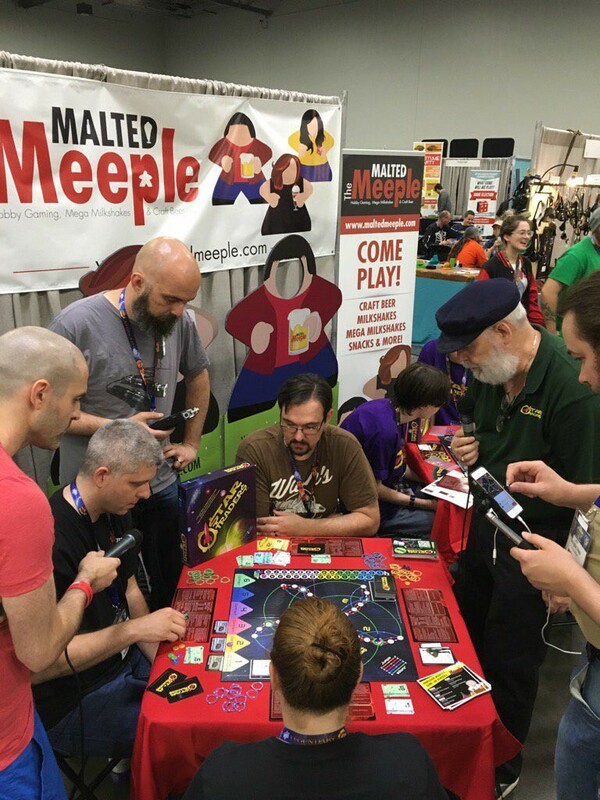 We’d been told that the typical BGG Con attendee is an alpha gamer — someone who drives decision-making on game purchases for his or her gaming friends, and who deeply analyzes games. After four days there, we can vouch for that description. One gamer sat down with about 15 minutes to spare between games and asked for a description of Star Traders. We started with the backstory, as usual (“you are a star trader …”), but he wasn’t interested. He simply wanted the mechanics, and he needed no explanation of why we had included any of it — he knew right away why there were five actions per turn (rather than four or six), what the pros and cons were of the Prestige Meter, and the various effects of the Trader’s Luck cards. I have no idea whether he will eventually get the game, but he seemed satisfied that the game worked. We also got a chance to connect with several backers whom we hadn’t met before — it was exciting to show them the game that they have been helping us make. All of them seemed pleased with the updated components and a few even had time to play a game or two or three 😉 with us. One of the cool things about taking the game to shows is getting to play with first time Star Traders. Some take to it really quickly, while others gradually discover the intricacies of the game as they play. Either way it’s always an enjoyable time. And talking about playing with gamers; I got into a conversation with another player who wanted a diceless variant. 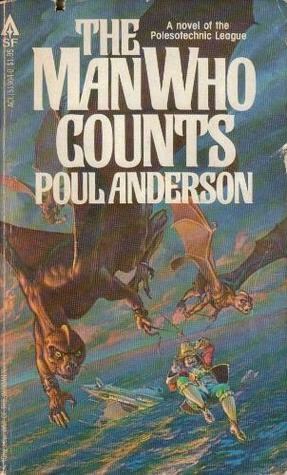 (Actually, I think he would have been happier if there weren’t any dice in the box at all.) 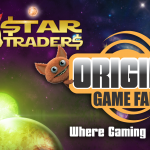 Having discussed it with him, I realize that we could design a game very much like Star Traders, without any dice — but it wouldn’t be Star Traders. Meanwhile, another player at the same table was vociferous in her desire to keep the dice in the game — she repeatedly told me that it would be much less fun without the dice. These kinds of interactions aren’t normal at the other shows we’ve been to, but it’s always good to get detailed feedback from knowledgeable gamers. Which isn’t a knock against any of those types of games; they are just less what I’m personally interested in playing. 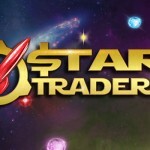 That’s been my overall objective with Star Traders: fun. It certainly isn’t the game for everybody, but I am convinced that it will be fun for a wide range of players, from young to old … once we get it into your hands! 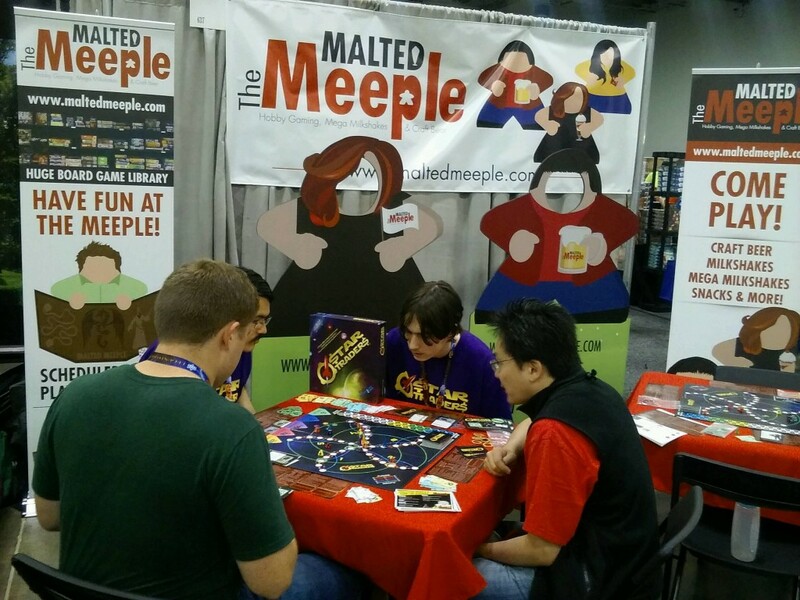 We also had the chance to play some other games while we where there, chat with fellow creators and even meetup with some of the Steve Jackson Games design team. 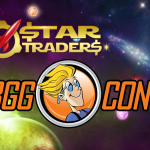 BGG Con is a great show and I can see us returning there again, but first we need to get this game out to you all and that’s what we’ve been focusing on since we got back. Read more about that in our latest Kickstarter Update. Meanwhile, back to the pixel mines! Along with trying to keep the manufacturing on track we’re also focusing on getting the other backer rewards ready for y’all. So if you’re a backer you can look forward to those coming together very soon. Here’s wishing you all happy holidays and a merry new year. 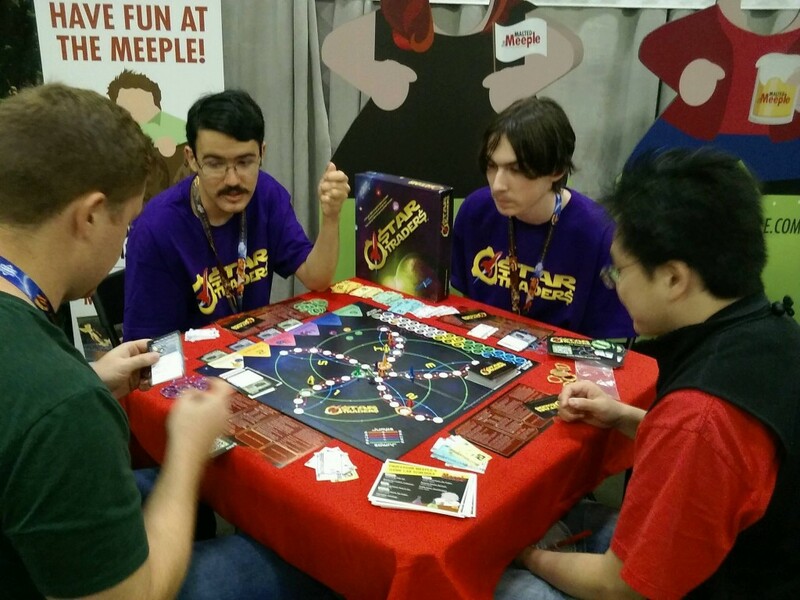 I’ve been to Columbus and back, spending four very full days at Origins, the national tabletop game convention. Will and Jesse (my two sons and two valuable members of the Emperor’s Privy Council) went with me. 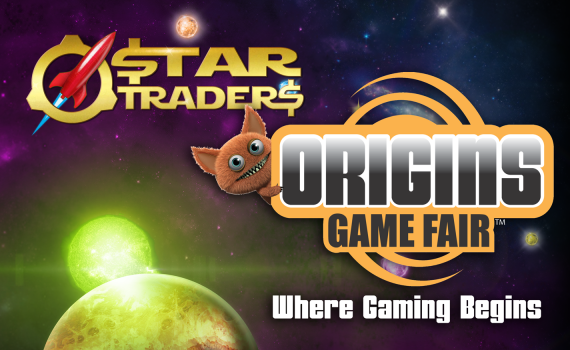 Our principal objectives were to demonstrate Star Traders and to sit down with the people who will be manufacturing the game. That, and since we were there, take the opportunity to play a few other games … which were all valuable research opportunities. 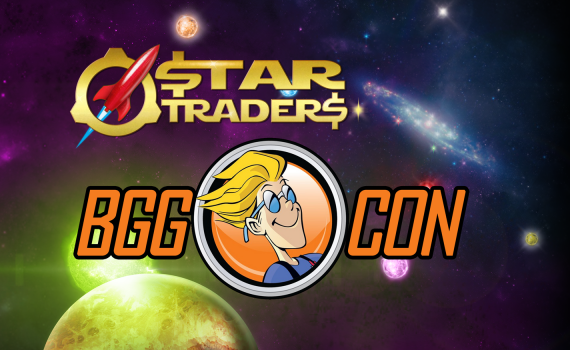 We also got a chance to play Star Traders a few other times, out in the open gaming area. 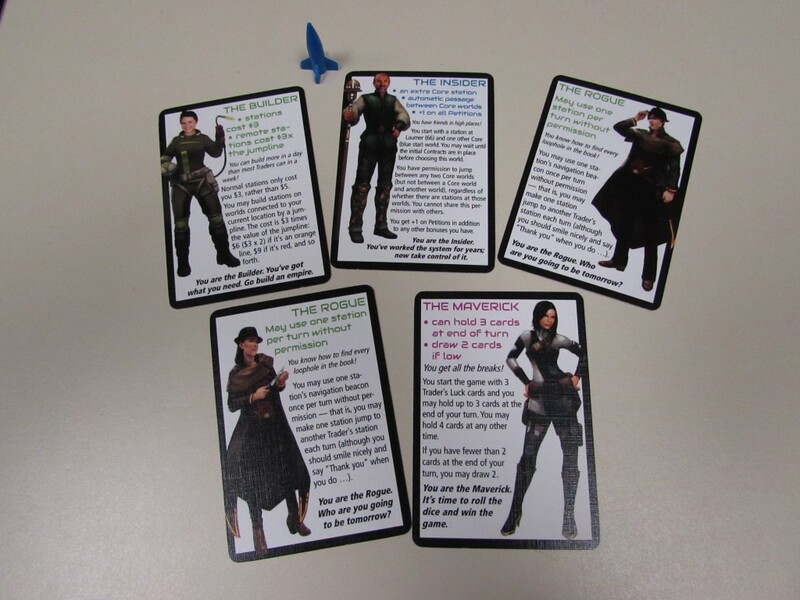 We had the new board and Trader’s Luck cards (I think the cards are nailed down now, and we’ve only got a couple more authors to sort out), and we had the new Personality cards with character art on them. We also had clay prototypes of new d4 contract markers. 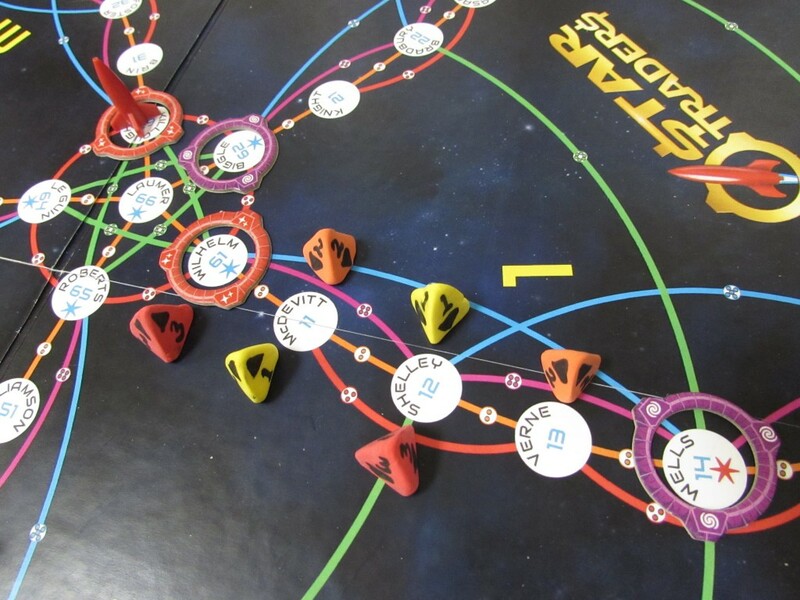 We’ve played several games with them now, and while they make finding pick-up and delivery worlds easier, a normal d4 is wider at the base than we’d like it to be, sometimes making it difficult to place among the station rings. We’re going to try narrowing one side down, and opening up the space around the closer worlds on the gameboard a bit more. And we’ve decided to run the Personality cards larger, to allow more room for the character art and text. Combining that with fewer player mats (since we now won’t need a player mat for each Personality) means a tidier and better looking game for you guys. We’ve also been able to make additional improvements to the components that we think you all will enjoy. Speaking of components, we’ve begun pre-press verification on files, the first step toward actual printing and publication. More slowly than we had wanted, but it’s happening! And while I was galavanting around Origins, our artists were busy crunching on Personality and Cargo art — it’s all getting done. 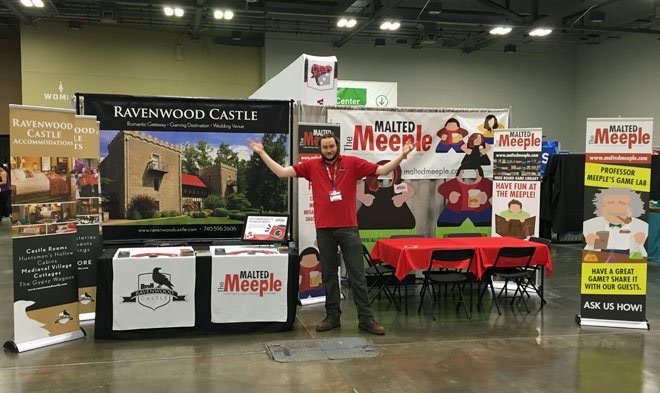 Origins and Gencon are both great to attend, because you get a chance to talk to the people who actually create the games — there are far fewer marketing guys and far more designers than at the electronic game conventions I’ve attended over the past few years. Having said that, I don’t know if I’ll have time to attend Gencon or Dragon Con (over Labor Day), but we’ll let you know if we’re able to get to either of those shows. Meanwhile, back to the pixel mines! I have another twenty authors to write up for the lore book, and those last component tweaks, and we’ll have a game!